With 17 gigs confirmed for both the San Antonio and the Magaluf hotels, this is going to be one belter of a season. More rock and roll, and lots of other stuff in between times got dusted off and re-adored as I finally got off my fat be-hind(I blame Christmas)and fulfilled my hazy, long ago full moon drunken promise to everyone’s favourite host with the most, Josito Pepua, and assuming my role as one half of Girlz Skool, I put on my skool tie and my headphones and got lost in the music and the tardis that it AK Pepua Bar, in La Marina. A special Big Up should go out at this point to the gorgeous Di Burns and her husband Louie, for their support on the night. It was a real pleasure to meet the two who were on the island for a few days to start the groundwork for their Battle of the Bands final in Ibiza this summer. Also, a high five to Adrian! Indeed, such a good night was had by yours truly, that I’ve decided to take myself off to Malaga this weekend for the RockinRace Festival- four days and nights of the crème de la crème of rockabilly lovely jubblyness. 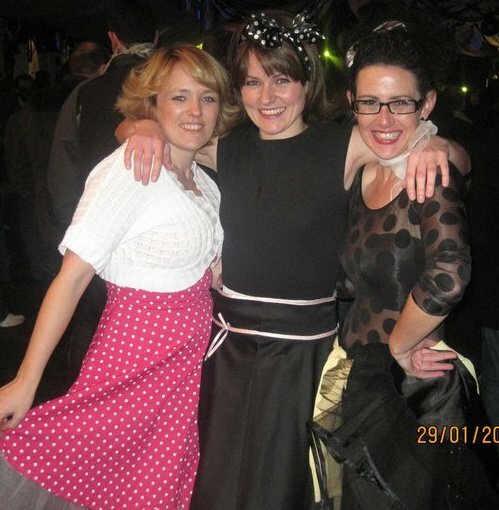 Eek- I really need to start packing my suitcase, this is going to be extreme 50s mania dressing up deliciousness! Bring it on! February 2, 2011. Tags: ibiza rocks, malaga, rock n roll, rockinrace, san antonio. Uncategorized. Leave a comment.